In the list of upcoming IPO Waa Solar Limited is planning to launch IPO (Initial Public Offering). The tentative size of the upcoming IPO i.e Waa Solar IPO is 20, 00,000 equity shares. The Public issue consists of Fresh Issue and offer for sale. Waa Solar IPO would open on 31 May and close on 4 th June,2018. Waa Solar IPO is 20, 00,000 equity shares. The public issue consist of Fresh Issue of 17,50,000 equity shares and Offer for Sale (OFS) of 2,50,000 equity shares at an issue price of 161 per Equity Share. 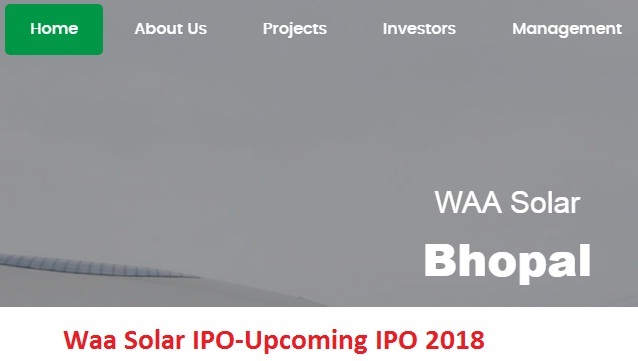 Waa Solar IPO will open on 31 May,2018 and close on 4 May,2018. Waa Solar Limited is engaged in the business of solar power generation by setting up Solar Power Projects and by investing in Special Purpose Vehicle (SPV) associates. The company was established on 9 Nov,2009 under the Provision of Companies Act,1956.At the time of incorporation of company, it was a private limited company. As a result the name of the company was “Waa Solar Private limited”. Later on the company was converted into Public Limited company on 12 Sept,2013 as a result the name of the company was also changed to “Waa Solar Limited”. Initially the company was Mumbai based but later on it was shifted to Gujarat. In 2010, Gujarat Urja Vikas Nigam Limited (“GUVNL”) has awarded the company the work of setting up of Solar Photovoltaic Grid Interactive Power Plant of 10MW capacity at village Nayka, Taluka-Sami, District Patan, to produce the Electric Energy and for sale of entire electrical energy, so produced, for commercial purpose from such project to GUVNL for a tenure of 25 years. GUVNL has entered into Power Purchase Agreement (“PPA”) and agreed to purchase such power through distribution companies (“Discom”). In 2013, Airport Authority of India, has entered into PPA with the company for setting up a solar power plant of 100 KWP at Raja Bhoj Airport, Bhopal on Built, Own and Operate (“BOO”) basis for a tenure of 25 years. There are three objective of the IPO. They are listed below. Visit Sharpcareerfinancialupates to get latest updates on Upcoming IPO 2018.